Quivira Vineyards and winery is located in Dry Creek Valley, Sonoma County, California and was founded in 1981 by Holly and Henry Wendt. In 2006 the vineyard was purchased by Pete and Terri Kight and they quickly brought in some interesting changes. Their new direction was to focus everyone involved in the vineyard on creating world class wines. To refocus the vineyard crew from a quantity centric mind set, to a quality centric mind set. The Kights also added additional high elevation vineyard land and some amazing 100 year old zinfandel vines. In addition to the quality goals, the Kights made some very big changes in the practices department. Quivira is a holistic and biodynamic vineyard. An example of this approach is that instead of using synthetic fertilizers, Quivira uses compost and cover crops to feed the vines. The first thing I noticed in this wine was a nice vibrant and intense nose. Plums and berries, but also a fairly strong whiff of alcohol. However, the aroma of alcohol was not out of balance with the fruit on the palate. The palate was ripe and plummy with a good dose of pepper. 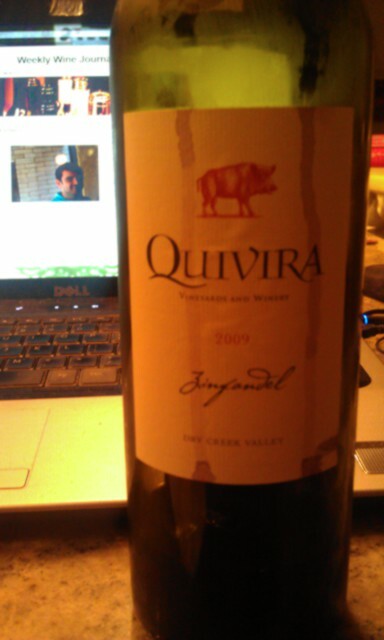 Zinfandel can quickly deteriorate into a wine dimensional raisin liquer but Quivira’s 09 Zin manages to stay out of that fray. The wine does have jammy components, but remains dry and complex enough to savor, rather than merely tolerate.